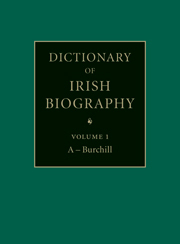 The Dictionary of Irish Biography is the most comprehensive and authoritative biographical dictionary for Ireland to date. It was edited by James McGuire and James Quinn and published in 2009 by Cambridge University Press in collaboration with the Royal Irish Academy. The 9 volume set contains “over 9,000 entries covering 9,700 lives, ranging from the earliest times to 2002.” Articles are between 200 and 15,000 words long and provide lively short summaries as well as detailed assessments. 700 advisors and scholars contributed biographical entries. The editors paid particular attention to outstanding women who have previously been overlooked as well as to a broad coverage of the modern period. This new reference work replaces Boylan’s classic Dictionary of Irish Biography and supplements the outstanding Oxford Dictionary of National Biography Online for the serious Irish Studies scholar. The print volumes can be found in the reference section on the first floor of Falvey Memorial Library.